In many languages, the word pita refers not to flatbread, but to flaky pastries: see börek for them. Pita (/ˈpɪtə/ or US: /ˈpiːtə/) or pitta (British English), is a family of yeast-leavened round flatbreads baked from wheat flour, common in the Mediterranean, Middle East, and neighboring areas. It includes the widely-known version with an interior pocket, also known as Arabic bread, Syrian bread, and other names, as well as pocketless versions such as the Greek pita, used to wrap souvlaki. Pita bread has roots in the prehistoric flatbreads of the Middle East. There is evidence from 14,500 years ago, during the Stone Age, that the Natufian people in what is now Jordan made a kind of flatbread from wild cereal grains. Ancient wheat and barley were among the earliest domesticated crops in the Neolithic period of about 10,000 years ago, in the Fertile Crescent. By 4,000 years ago, bread was of central importance in societies such as the Babylonian culture of Mesopotamia, where the earliest-known written records and recipes of bread-making originate, and where pita-like flatbreads cooked in a tinûru (tannur or tandoor) were a basic element of the diet, and much the same as today's tandoor bread or taboon bread. However, there is no record of the steam-puffed, two-layer "pocket pita" in the ancient texts, or in any of the medieval Arab cookbooks, and according to food historians such as Charles Perry and Gil Marks it was likely a later development. The first mention of the word in English cited in the Oxford English Dictionary was in 1936. The English word is borrowed from Modern Greek πίτα, in turn from the Byzantine Greek πίτα "bread, cake, pie, pitta" (attested in 1108) and possibly from the Ancient Greek πίττα or πίσσα "pitch/resin" (for the gloss), or Ancient Greek πικτή (pikte), "fermented pastry", which may have passed to Latin as "picta" cf. pizza. It was received into Levantine Arabic (as fatteh, since Arabic lacks the sound /p/). Other hypotheses trace the word back to the Classical Hebrew word patt פת (literally "a morsel of bread"). It is spelled like the Aramaic pittəṭā/pittā (פיתה), from which it was received into Byzantine Greek (see above). Hypotheses also exist for Germanic or Illyrian intermediaries. The word has been borrowed by Turkish as pide, and appears in the Balkan languages as Serbo-Croatian pita, Romanian pită, Albanian pite, Bulgarian pitka or pita. 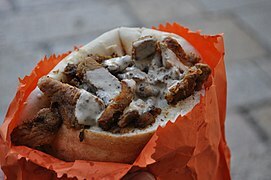 In Arabic, the phrase خبز البيتا (pita bread) is sometimes used; other names are simply خبز 'khubz, bread' or الخبز العربي 'Arab bread' or خبز الكماج 'al-kimaj bread'. In Egypt, it is called ʿaish (عيش) or ʿaish baladi (عيش بلدي), meaning rustic, local, or rural bread. 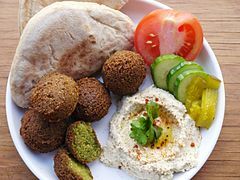 "'Aish" also means life in Arabic, highlighting the importance of pita bread in Egyptian culture. In Greek it is called aravikē pita (lit. 'Arabic pastry'). 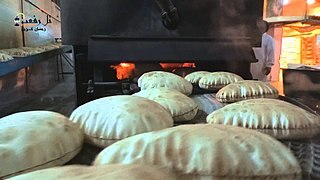 Most pita are baked at high temperatures (450–475 °F (232–246 °C)), which turns the water in the dough into steam, thus causing the pita to puff up and form a pocket. When removed from the oven, the layers of baked dough remain separated inside the deflated pita, which allows the bread to be opened to form a pocket. However, pita is sometimes baked without pockets and is called "pocket-less pita". Regardless of whether it is made at home or in a commercial bakery, pita is proofed for a very short time—only 15 minutes. Modern commercial pita bread is prepared on advanced automatic lines. These lines have high production capacities, processing 100,000 pound (45,000 kg) silos of flour at a time and producing thousands of loaves per hour. 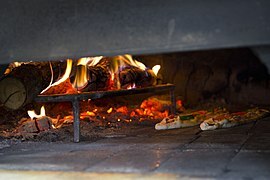 The ovens used in commercial baking are much hotter than traditional clay ovens—800–900 °F (427–482 °C)—so each loaf is only baked for one minute. The pita are then air-cooled for about 20 minutes on conveyor belts before being shipped immediately or else stored in commercial freezers kept at a temperature of 10 °F (−12 °C). 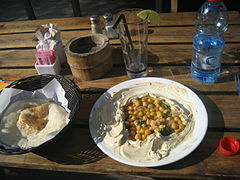 Pita can be used to scoop sauces or dips, such as hummus, or to wrap kebabs, gyros, or falafel in the manner of sandwiches. It can also be cut and baked into crispy pita chips. 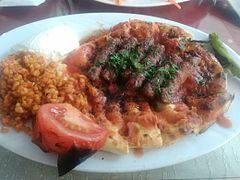 In Turkish cuisine, the word pide may refer to three different styles of bread: a flatbread similar to that eaten in Greece and Arab countries, a pizza-like dish where the filling is placed on the (often boat-shaped) dough before baking, and Ramazan pide. 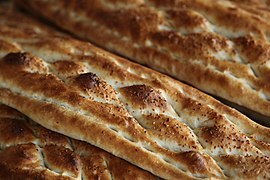 The first type of pide is used to wrap various styles of kebab, while the second is topped with cheese, ground meat, or other fresh or cured meats, and/or vegetables. Regional variations in the shape, baking technique, and toppings create distinctive styles for each region. In Cyprus, pita is typically rounder, fluffier and baked on a cast iron skillet. It is used for souvlakia, sheftalia, halloumi with lountza, and gyros. In Greece the word pita means "pastry" and is usually used for various cakes and pastries like spanakopita (spinach pie) and karydopita (walnut cake) unrelated to the English language "pita" flatbread. Traditional breads in Greek cuisine are leavened loaves, such as the round καρβέλι karvéli or the oblong φραντζόλα frantzóla. This style of pita flatbread, in the English language meaning of the word, is almost exclusively used as a wrap for souvlaki or gyros with usually garnished with some combination of tzatziki sauce, tomatoes, onions, and french fries. ^ a b c d e Marks, Gil (17 November 2010). Encyclopedia of Jewish Food. HMH. ISBN 9780544186316 – via Google Books. ^ "Pita". Cambridge English Pronouncing Dictionary (18th ed.). Cambridge University Press. 2011. ^ Uvezian, Sonia (2001). Recipes and Remembrances from an Eastern Mediterranean Kitchen: A Culinary Journey Through Syria, Lebanon, and Jordan. Siamanto Press. p. 313. ISBN 9780970971685 – via Google Books. The best-known bread of the region is khubz arabi (or, simply, khubz), a round, flat, slightly leavened loaf about one-fourth inch thick and with a pocket inside. It is made in three different sizes: large (eight or more inches in diameter), medium (six to eight inches), and small (about five inches). In America, where it has become very popular, this bread is known as pita. A pocketless version is also available. In some Arab communities khubz arabi is called kmaj (from the Persian kumaj), while in others, kmaj refers only to the pocketless type. ^ Perry, Charles (21 August 2014). Davidson, Alan (ed.). The Oxford Companion to Food. Oxford University Press. pp. 629–630. ISBN 9780191040726 – via Google Books. ^ Wright, Clifford A. (2003). Little Foods of the Mediterranean: 500 Fabulous Recipes for Antipasti, Tapas, Hors D'Oeuvre, Meze, and More. p. 61. ^ Roden, Claudia (24 December 2008). The New Book of Middle Eastern Food. Knopf Doubleday Publishing Group. pp. 393–396. ISBN 9780307558565 – via Google Books. ^ Press, The Associated (3 January 1988). "Mastering the Art of Babylonian Cooking". The New York Times. ISSN 0362-4331. Retrieved 16 March 2019 – via NYTimes.com. ^ Bottéro, Jean (15 April 2004). The Oldest Cuisine in the World: Cooking in Mesopotamia. University of Chicago Press. pp. 47–49. ISBN 9780226067353 – via Google Books. ^ Helman, Anat (28 October 2015). Jews and Their Foodways. Oxford University Press. ISBN 9780190265434 – via Google Books. ^ Babiniotis, Georgios (2005). Λεξικό της Νέας Ελληνικής Γλώσσας [Dictionary of Modern Greek] (in Greek). Lexicology Centre. p. 1413. ISBN 960-86190-1-7. ^ Bracvini, G. Princi (1979). Archivio Glottologico Italiano. 64. pp. 42–89. Cited by the OED. ^ Kramer, J. (1990). Balkan-Archiv. 14-15. pp. 220–231. Cited by the OED. ^ Civitello, Linda (2007). Cuisine and culture: a history of food and people (Paperback ed.). Wiley. p. 98. ISBN 0471741728. ^ Cauvain, Stanley (2015). Technology of Breadmaking. New York: Springer. p. 232. ISBN 978-3-319-14687-4. ^ a b Bard, Kathryn A. (2005). Encyclopedia of the Archaeology of Ancient Egypt. London: Routledge. p. 178. ISBN 978-1-134-66525-9. ^ a b McNulty, Mary (2007). "Pita Bread". How products are made. Retrieved 8 May 2018. ^ Tanis, David (21 February 2014). "Homemade Pita Bread". The New York Times. Retrieved 8 May 2018. ^ Colon-Singh, Rose (12 June 2012). "Make Flatbread | Turkish Pide Recipe". Fine Dining Lovers. Retrieved 10 December 2018. ^ "Dayi'nin Yeri Turkish Restaurant, Cliffside Park, NJ". www.chowgofer.com. Retrieved 10 December 2018. ^ Elise, Lola (16 December 2009). "Pide Recipe". Tasty & Healthy Arbuz. Retrieved 10 December 2018. ^ Babs, Serena (17 January 2011). 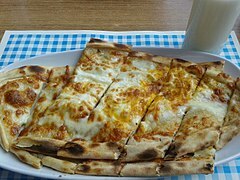 "Turkish Pizza aka Kiymali Pide". Tasty Kitchen. Retrieved 10 December 2018.